New Ardmore signing Steve Lazars in action. 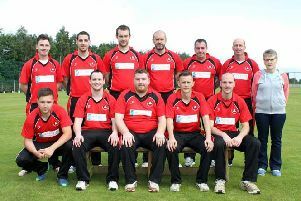 Former Ballymena overseas player Steve Lazars has joined Ardmore ahead of the new North West cricket season after spending 2017 on the north coast with Coleraine. The all-rounder didn't set the world alight at Sandel Lodge if truth be told but there were certainly glimpses of his talent. He scored a half century as the North West Warriors held on for a draw against Leinster at Oak Hill and proved a potent threat with the ball throughout the summer. "I'm really excited with the prospect of a new challenge playing with Ardmore. I've kept myself fit during the close season so I will be ready to go as soon as it starts next month. "Ardmore have talked to me about helping consolidate their batting line up in the middle order as well as giving a left arm spin bowling option to the team." Lazars confirmed that he has already trained with his new team-mates and has been impressed with the coaching structure that includes Kevin Martin, Gary Neely and Bobby Rao.